Definition at line 224 of file btrfs_drv.h. Definition at line 234 of file btrfs_drv.h. Definition at line 229 of file btrfs_drv.h. 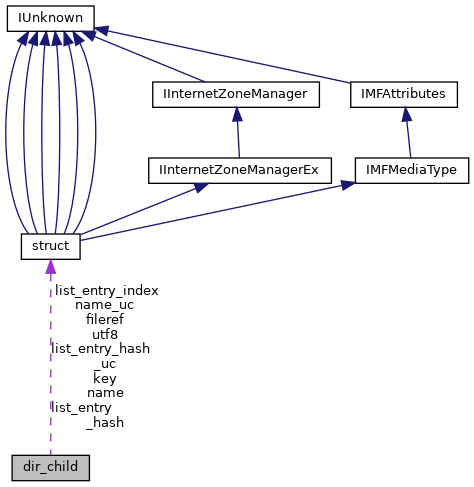 Referenced by insert_dir_child_into_hash_lists(), move_across_subvols(), query_directory(), remove_dir_child_from_hash_lists(), and set_rename_information(). Definition at line 231 of file btrfs_drv.h. Definition at line 226 of file btrfs_drv.h. Referenced by add_dir_child(), fill_in_hard_link_information(), flush_fileref(), move_across_subvols(), next_dir_entry(), open_fileref_child(), set_link_information(), and set_rename_information(). Definition at line 225 of file btrfs_drv.h. Referenced by flush_fileref(), move_across_subvols(), and query_directory(). Definition at line 236 of file btrfs_drv.h. Definition at line 237 of file btrfs_drv.h. Definition at line 235 of file btrfs_drv.h. Referenced by move_across_subvols(), next_dir_entry(), and set_rename_information(). Definition at line 230 of file btrfs_drv.h. Referenced by _Dispatch_type_(), fileref_get_filename(), fill_in_hard_link_information(), move_across_subvols(), open_file(), open_fileref_child(), query_directory(), set_basic_information(), set_end_of_file_information(), set_rename_information(), and write_file2(). Definition at line 232 of file btrfs_drv.h. Referenced by move_across_subvols(), open_fileref_child(), query_directory(), and set_rename_information(). Definition at line 233 of file btrfs_drv.h. Definition at line 227 of file btrfs_drv.h. Referenced by delete_reparse_point(), file_create(), query_directory(), and set_symlink(). Definition at line 228 of file btrfs_drv.h. Referenced by file_create(), flush_fileref(), fsctl_set_xattr(), move_across_subvols(), send_subvol_header(), set_link_information(), and set_rename_information().